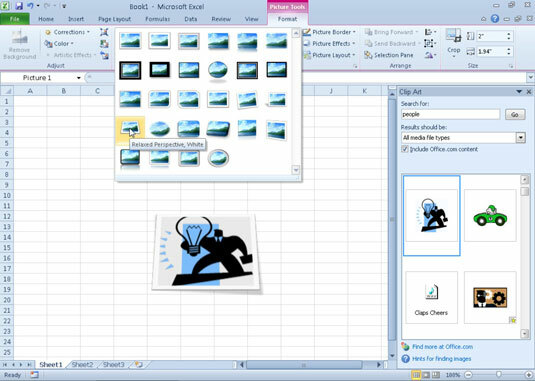 When a clip art image or imported picture is selected, Excel 2010 adds the Picture Tools Format tab to the Ribbon. Use the commands on the Picture Tools Format tab if you need to edit or format clip art or pictures in your worksheets. Remove Background opens the Background Removal tab and makes a best guess about what parts of the picture to remove. You have the option to mark areas of the picture to keep or further remove, and the shaded areas automatically update as you isolate what areas of the picture you want to keep. Click Keep Changes when you’re finished or Discard All Changes to revert back to the original picture. Corrections opens a drop-down menu with a palette of presets you can choose for sharpening or softening the image and/or increasing or decreasing its brightness. Or select the Picture Corrections Options item to open the Format Picture dialog box with the Picture Corrections tab selected. Here, you can sharpen or soften the image or modify its brightness or contrast by selecting a new preset thumbnail on the appropriate Presets palette, by entering a new positive percentage (to increase) or negative percentage (to decrease) in the appropriate combo box, or by dragging its slider. Color opens a drop-down menu with a palette of Color Saturation, Color Tone, or Recolor presets you can apply to the image. You also can set a transparent color (usually the background color you want to remove from the image), or select the Picture Color Options item to open the Picture Color tab of the Format Picture dialog box. Here, you can adjust the image’s Color Saturation, Color Tone, or Recolor presets by set a new saturation level or color tone temperature by entering a new percentage in the appropriate combo box or selecting it with a slider. Artistic Effects opens a drop-down menu with special effect presets you can apply to the image. Or select the Artistic Effects Options item to open the Artistic Effects tab of the Format Picture dialog box, where you can apply a special effect by selecting its preset thumbnail from the palette. Use Artistic Effects to apply a special effect, such as Paint Brush, to a picture. 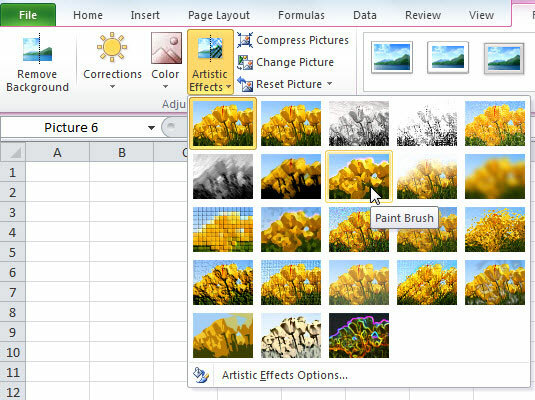 Compress Pictures opens the Compress Pictures dialog box, where you can choose to compress all images in the worksheet or just the selected images to compact them and thus make the Excel workbook somewhat smaller when you save the images as part of its file. Change Picture opens the Insert Picture dialog box where you can select an image in a new graphics file to replace the picture — when replacing the currently selected picture with the new image, Excel automatically sizes and formats the new image with the settings applied to the previous image. Reset Picture removes all formatting changes made and returns the picture to the state it was in when you originally inserted it into the worksheet. You can also format a selected clip art image or imported picture by opening the Format Picture dialog box (Ctrl+1) and then selecting the appropriate tab. Border shape and color on the Picture Border button’s drop-down palette. Shadow or 3-D rotation effect on the Picture Effects button’s drop-down menus. Layout on the Picture Layout button’s drop-down palette to format a picture with SmartArt styles. Use Live Preview in the Picture Styles gallery to see how a style affects your picture before you apply it.